When I think of smoothies, I don’t often consider lemon as a particularly tempting flavor. Lemon in cocktails, muffins, or chicken recipes? Yes, all the way. But lemon in a smoothie? Sounds a little odd. I would think the tangy taste would be a bit too overpowering for a snack as tame as a smoothie–or that putting lemon juice in with dairy would produce something curdled. So I guess I shouldn’t be surprised that the flavor of lemon–especially when paired with raspberry–in this easy smoothie turned out refreshing and delicious. The sunshiney tartness mixed with that pretty rosy color just stole my heart. And my mouth. Plus, a lemon raspberry smoothie gave me an excuse to use the candied lemon slices I bought from Trader Joe’s, which I didn’t actually need, but were so cute and appealing I couldn’t resist. (Like so many other things at Trader Joe’s.) Now that the package is open, I guess I’ll have to go and make those other 13 lemon recipes and garnish the heck out of ’em. Looking for more lemony goodness this winter season? Try some of my other recipes! 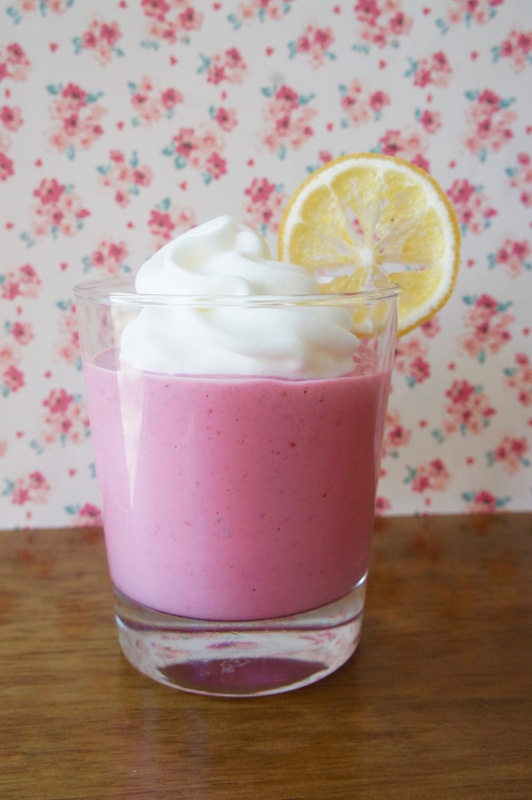 This lemon raspberry smoothie with the prettiest pink color makes a refreshing, tangy snack. Place raspberries, yogurt, honey, and among milk in a blender. Zest lemon directly into the blender, then juice the 1/2 lemon directly in as well, straining for seeds. Blend well and top with whipped cream, if desired.